I’ve described in an earlier post about my experience with Blockbuster game rentals. Being an N64 kid, I was introduced to legend of Zelda via Ocarina of Time shortly after its American release in November 1998. I was in third grade at this time, and in the next spring I started renting the game from blockbuster every weekend, consecutively, for weeks on end. There is something special about Ocarina, the first 3D open world in the Zelda franchise. Every Friday I would run to Blockbuster’s game aisle in search of the Ocarina of Time box and pray it hasn’t been rented out. Soon came and I had convinced my Mom to buy it, because it would save money over constantly renting it. This summer was most notable because I began to chase the neighborhood girls, and I devoted A LOT of time to that. 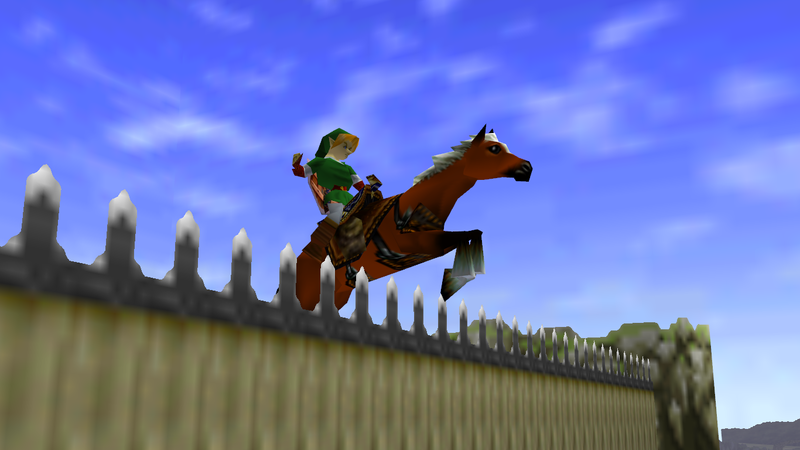 I remember the first girl I ever kissed because later that night my friends slept over and we stayed up late to finally free Epona from Lon Lon Ranch. I was not very good at gaming at age 8, in fact I sucked. The furthest I got in the game on my own was the Water Temple, arguably the hardest dungeon in any Zelda game. My friend Joey, who was 10-11 at this time, was the first person on our block to beat the game. Watching Joey’s final battle with Ganon was amazing, artistic, thematic storytelling. After Ocarina came Majora’s Mask in April 2000. According to Hyrule Historia, the land of Termina wasn’t a neighboring country to Hyrule, but in fact, a parallel universe’s version of Hyrule that Link travels to after going through some portal in the Lost Woods. I didn’t learn this until adulthood, but as a kid I didn’t care. I just loved this game so hard. It was so much fun! It introduced two new game dynamics that weren’t in Ocarina, that is mask collecting, and the time mechanic. There are special masks in the game that can transform you into the different races that were introduced in previous games like Gorons, Zoras, and Deku Scrubs. 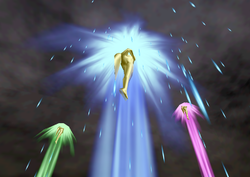 With each race you had different weapons and abilities. 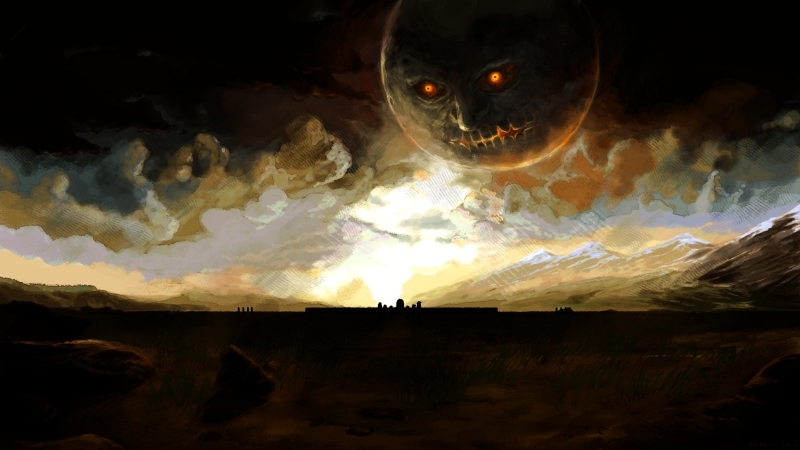 The time mechanic in the game was written into the story; the Moon has been falling out of the sky and is set to land on clock town in three days time. Using your trusty ‘Ocarina of Time’ you can manipulate the flow of time using different songs, but no matter what you do the clock keeps ticking. If you fail to complete a mission in the time alotted you will be crushed by the moon, but before midnight on the third day you can play the song of time to travel back to Dawn of the First Day. Like Ocarina, ironically, I couldn’t get past the Water Temple on my first go. After a while I put the N64 without beating these games. Later I played Link’s Awakening DX on Gameboy Color. Whose gameplay style was more like the original game than the 3D open world presented in Ocarina and Majora’s Mask. Link’s Awakening was the frist Zelda game I beat on my own. Fast forward a couple Christmasses and my parents gave my brother and me a brand new black Gamecube complete with… (Opens chest) Ocarina of Time and Majora’s Mask double disc for gamecube (raises game over head). 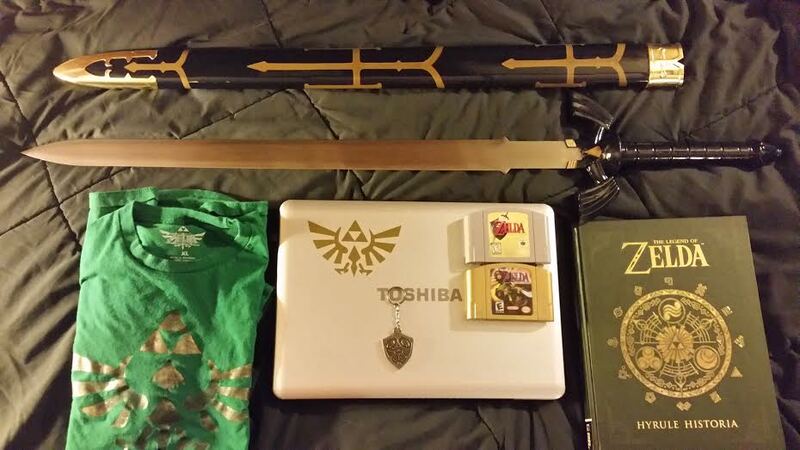 The following year completely summarizes the joy that Zelda has brought to my life. My friends and I spent countless summer days in my basement playing my gamecube version of Ocarina of Time on one television, while someone else played an N64 version of Majora’s Mask on a smaller 12in television that Andy took from his Mom’s kitchen, and someone else practiced Epona’s song on my brother’s acoustic guitar. I beat each game twice that year, once on each console and 100-percenting both games as well. I became so skilled in my group of friends, they would beg me to beat dungeon bosses for them on their save files. On Feb 13, Nintendo is re-releasing Majora’s Mask for Nintendo 3DS in North America, and although I won’t be getting one, I’m excited for the next generation of gamers to be introduced to it. I could go on and on about other Zelda games or the mythology behind them (and I really want to), but this is a nice place to stop. I would like to thank Miyamoto Sensei for creating a world that is infinitely more magical than the one I grew up in. Praise the three Goddesses.